1. When did St. Paul's start to be a tourist attraction? 2.How many times did they built a church in this site? These are some of the questions that could be answered in a tourist guide. 1. Read the following text and some more information in the links on the left. 2. Think of the questions that could be answered. 3. Then prepare a list of questions 10 to 20 to be included in a tourist guide with the correspondent answers. 4. Be as much original as you can. Work in pairs. 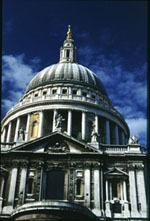 St. Paul’s is the Cathedral church of London and an important national site. There has been a Cathedral dedicated to St. Paul on this site since 604. The first evidence of St. Paul’s as tourist attraction can be found as early as the eighth century. In 675, Erkenwald was consecrated bishop of London. After his death he became a saint and his shrine in St. Paul’s drew pilgrims from all over Europe. Pilgrimage was the earliest form of tourism, and the impact of travel to places such as Rome, Jerusalem, and Santiago de Compostella in Spain should not be underestimated. When the Cathedral was destroyed by fire and the Danes, St. Erkenwald’s body was saved, and his shrine restored. When fire destroyed the Cathedral in 1087 and yet another one was built on the site. The medieval cathedral was a source of pride for the people of London. It was even bigger than the modern Cathedral, topped with a spire, which rose to 149m. But the popularity of St. Paul’s began to diminish as no one took responsibility to the keep the vast building in good repair. People used the Cathedral as a short cut, and even as a market place and by 1588, large cracks had appeared in the stonework. When money and expertise was finally raised for repairs in 1642, the Cathedral was turned into an army barracks during the Civil War. In 1666 the Great Fire of London saw St. Paul’s badly damaged again. King Charles II appointed Christopher Wren to design a new Cathedral. St. Paul’s has been a beacon of hope and a symbol of the nation for the past 300 years. It survived the Blitz, and the picture of the Dome surrounded by the fire of incendiary bombs has become a vivid reminder of the horrors of the War. Every year, hundreds of thousands of tourists, modern pilgrims, pass through the doors to marvel at the light and space that Wren succeeded in capturing; a potent reminder of the enduring significance of St. Paul’s in the lives of people all over the world.